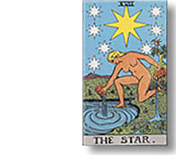 The Tarot cards are an ancient system of divination that uses a set of cards to help a person understand situations in her or his life. A Tarot reading often sheds light on underlying sets of circumstances in your life. A detailed reading provides a sense of the probabilities of any situation, but it also leaves the course of action up to you. The main thing to remember is that a Tarot reading offers insight into what is happening to you – in the present. I am more than happy to help you “read the cards” and provide advice, but my primary enjoyment comes from watching my clients make decisions that positively impact their lives.